Coloring books might seem like an antiquated plaything given all the drawing and painting apps available for tablets, but learning to master a colored pencil or crayon and stay within the lines helps develop hand-eye coordination. So instead of trying to convince kids to put down their tablets (or phones) Crayola's instead created a line of enhanced coloring books that come to life with the help of augmented reality after they've been colored. Once kids have colored in a page they simply need to launch the Crayola Color Alive! app, point it at their masterpiece, and then wait for it to come to life. The 4D augmented reality technology that powers the app was developed by a company called DAQRI, and it uses color recognition so that no matter how unorthodox a child's color choices might be, the 3D creatures seen on-screen will look exactly the same as the ones on paper. 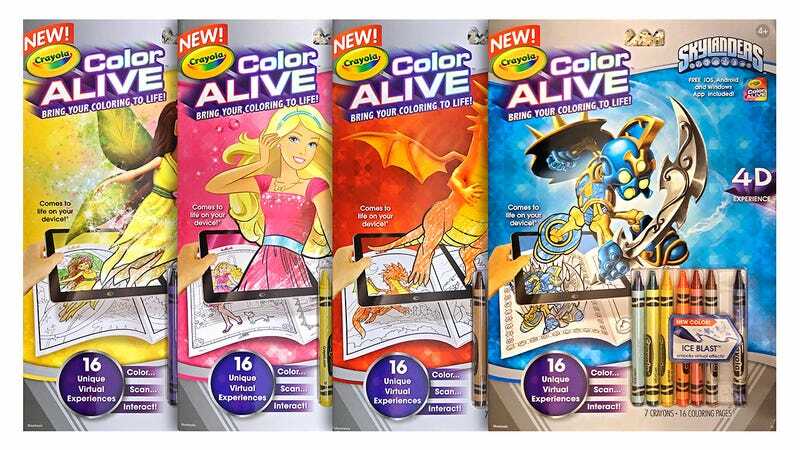 The books even come with a set of seven crayons including a special color that turns into on-screen effects like fire, ice blasts, and even pixy dust.